The popular XPR-10AS-168 car lift uses the same great features of the standard XPR-10AS model, but adds 2 foot height extensions on the columns thus increasing your vehicle service capabilities. The extra column height allows you to raise taller trucks with ladder racks and sprinter vans without worrying about tripping the shut-off bar before maximum lifting height is reached. Now you'll be able to get any vehicle all the way up so you can stand up free and clear underneath. The BendPak XPR-10AS-168 Lift is ALI and ETL Certified. NOW IN NEW GUNMETAL GRAY!! The BendPak XPR-10AS-168 provides flexibility that most manufacturers don't offer. This 2 post hoist for sale offers the same features as our most popular XPR-10AS, but with an added 2 feet in column height. This feature allows you to raise taller sprinter vans, service vans and even pick up trucks with caps and ladder racks without having to worry about tripping the shut-off bar up above before you've reached the maximum lift height. These sprinter vans have become extremely popular in the last few years and will not be able to be raised completely on a standard height lift. If you want your technician to be able to service these popular vehicles, you better have one of these hoists. Be the only specialty auto shop in your area with the capability to service these vehicles. This will require a ceiling height of greater than 14 feet. The smart design of 30 degree rotated columns and asymmetric design means no more dings when your technician opens the automobile doors. Combined with premium features and leading technology and you've got a lift that is a leader in it's field. The BendPak Tru-Metric design means that you can not only position a vehicle asymmetric (center of auto behind columns), as well as symmetric (center of auto centered between columns). It truly gives you the best of both worlds. These features combine to increase not only safety, but also worker productivity. The extra height that the BendPak XPR10A-168 lift offers allows you to raise tall vehicles while standing up underneath. That's why BendPak is ahead of the competition. They're always innovating and offering features that the other guys don't. They offer probably the widest variety of lifts on the market. The BendPak XPR-10A-168 is a premium direct drive, closed top model with a symmetric configuration and a 10,000 lb. capacity. The XPR Series 2-post car lift is engineered for professional auto shops as well as the home hobbyist. It is comprised of features to make is safer, more reliable and more durable than the competition. They also made it more efficient, to increase your shop's productivity and reduce expenses and maintenance as you'll see if you continue scrolling down below. If you want a premium automobile lift at a reasonable price, the XPR lifts are for you. These 2-post models are suitable for sports cars and compact cars as well as commercial vehicles and full size pick up trucks. Direct drive technology means that each lift carriage is raised directly by a low pressure hydraulic cylinder. This means less stress on the hydraulic system and a safer, more reliable design. The XPR 2 post hoist for sale shows why BendPak is on top. They feature the highest quality components along with meeting the highest safety standards that go above and beyong ALI and OSHA standards. No other manufacturer offers so much, for such a reasonable price. A wide array of optional accessories to make your lifting experience safer and easier are available. Of course, the standard features included with each model far surpass most of the competition. Serious professionals have known for decades that when you purchase a BendPak car lift, you can count on longevity and reliability. The XPR line furnishes all the tools you need to get the job done on time and on budget. Their reputation for quality and safety are legendary. And they won't put a dent in your wallet. 30° rotated columns The XPR-10A-168 features columns that are rotated at a 30 degree angle. This allows for even greater clearance when trying to enter or exit the vehicle after driving it through the columns. Two lifts in one - The Tru-Metric design of the BendPak XPR-10A asymmetric models allows you to position the auto symmetric as well as asymmetric. It's like having two lifts in one., providing versatility beyond the typical lift. Extended column optional - Allows an extra 2 feet of clearance up above to allow you to raise extra tall box trucks and sprinter vans without tripping the shut-off bar prematurely before you reach full lifting height.Gives you the flexibility of increasing the overhead clearance to maximize the vehicles you can service. This feature is standard on extra tall models. Triple-telescoping front arms and two-stage rear arms Increases overall arm positioning for lifting a variety of different wheel base vehicles. Overall arm sweep and minimum arm reach are also extended to precisely lift vehicles that have unibody construction, OEM recommended pick-up points and wide and / or narrow wheelbase configurations. 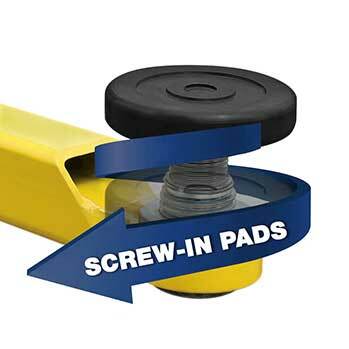 Low profile frame screw pads - allow you to get under most low profile sports cars that might be difficult to reach with most hoists. Can be adjusted infinitely up to 2.5" for the ultimate versatility. 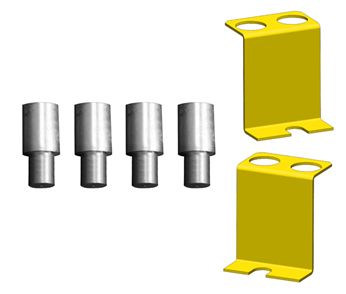 Truck and van adapters - Many manufacturers charge extra for these vital components. These extensions come in 63 mm. 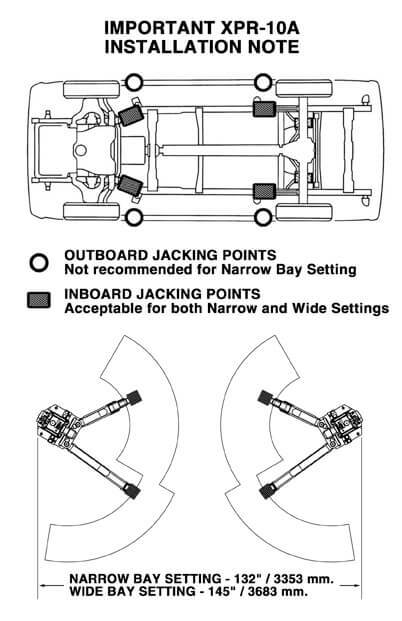 This allows you to get around fuel tanks and running boards to get at hard to reach frame jacking points. Durable powder coat finish - The powder coating process used on the all XPR series lifts is superior to others in that it is a meticulous process that takes 10 steps to complete. First, all components are inspected to ensure they are clean before being sandblasted. After sandblasting, all components are washed through 5 stages of huge phosphate tanks that can handle parts up to 25 feet long. Once cleaned, the parts are dried immediately to prevent rust. Then, the components are Outgassed, which is a process that pre-bakes the components in an oven to prep for coating. Many systems take a shortcut here. Doing that could cause problems with the final coat, including imperfections like chipping and bubbling, which is common on many inferior models. High temperature masking tape and silicone plugs are then used to cover any holes or components that need to be covered. Next, all components are given a thinner wipe to remove any possible prints or debris that could have occurred. After that, they are suspended on an electrostatically grounded conveyor line. and an electrostatic spray gun applies the powder. Finally, the parts are cured in 400 degree ovens for 3/4 of an hour.